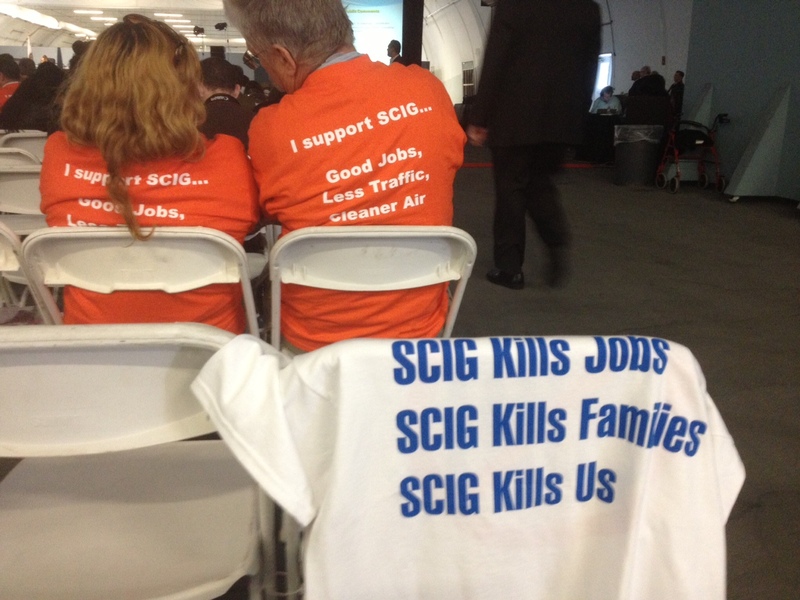 In what is undoubtedly a controversial decision–not to mention an utterly disheartening one as well for the multitude of community groups and leaders who opposed the project–the Harbor Board of Commissioners for the Port of Los Angeles voted unanimously to approve the building of the $500 million Southern California International Gateway (SCIG) rail yard. It will now go before the Los Angeles City Council for final approval. The project has been years in the making (it was proposed in 2005) and the reasoning for the opposition is clear–ultimately unproven and outright disregarded aspects of the final EIR distributed discovered by respected researchers throughout the L.A. region–and makes the vote rather egregious in nature. However, a multitude of groups and people–including Long Beach Mayor Bob Foster, Long Beach 7th District Councilmember James Johnson (whose district is most affected by the project), the East Yard Communities for Environmental Justice, Communities for a Better Environment, Legal Aid Foundation of L.A., Long Beach Alliance for Children with Asthma, Natural Resources Defense Council, Long Beach Community Action Partnership, Coalition for Clean Air, and Physicians for Social Responsibility–claim otherwise. And came to the meeting packed with documentation. Perhaps the largest failure within the final EIR’s documentation is its lack of future considerations within the trucking industry itself, specifically transloading. This trend–brought up in Streetsblog months ago as a factor within increased pollution–is vastly growing. It involves transporting three 40-foot containers, the size of containers in which international goods arrive in, into two 53-foot containers, the size of local container shipments, in order to save money. BNSF claims SCIG will divert more than a million trucks off the 710 freeway. Instead of traveling the additional miles to the northern Hobart yard, they’ll comfortably harbor themselves at the closer SCIG. However, BNSF fails to note that they have explicitly stated that SCIG will handle international containers only. This means they’ll be transloading, which then in turn means they’ll actually still be going to Hobart which handles domestic containers (and also explains the planned expansion of Hobart). While trucks from the Port itself might be lowered, trucks from SCIG will reach high volumes, with an estimated 5,500 additional truck trips and 16 train trips daily. The transloading of containers, according to a study conducted by the Port of Los Angeles itself, is at 29% of total cargo while another study by Cambridge Systematics puts it at 27%–three times higher than admitted within the DEIR. The implications of such was succinctly pointed out by USC Professor of Clinical Preventative Medicine Andrea Hricko when she noted the lack of reference to reduced lung functioning amongst children near freeways, rail yards, and areas of heavy traffic. But for many, it doesn’t erase the long-term impacts of the project. Angelo Logan of the East Yard Communities for Environmental Justice was blunt in his assessment: the vote is nothing short of environmental racism. This is a project that needs to be built and it is good for all that the Harbor Commission’s made he right choice. This will get thousands of container tucks off the freeways and local streets.Now we need to see that mitigation measures are taken care by the BNSF to see that the noise and air quality in the neighborhoods to the east of the new yard is not only maintained but improved..
Can you help me understand how a project with an anticipated annual trip generation of over two million trucks (Table 3.10-21 of FEIR) gets trucks of the network and improves air quality? Is a Reduction of 1.5 Million New Trucks Worth Building a Rail Yard Near Residential West Long Beach?